Vinod Dham is Engineer,Entrepreneur and Venture Capitalist .He is popularly known as ‘Pentium Engineer’ for his contribution to development of highly successful Pentium Micro-Processor of Intel Co.of USA He is a mentor, advisor and sits on the boards of many companies, including promising startups funded through his India-based fund Indo-US Venture Partners, where he is the founding Managing Director. Er.Ing.Vinod Dham’s accomplishment as ‘Pentium Engineer ‘ and as an Indian-American technology pioneer from Silicon Valley;is being celebrated at a first-ever exhibition on South Asians in National Museum of Natural History at the storied Smithsonian in Washington DC, highlighting Indian-Americans who have helped shape America. 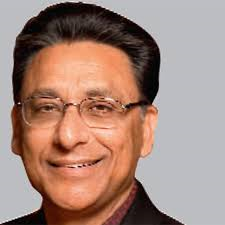 Er.Ing.Vinod Dham was born in 1950.His father was a member of the army civilian department who had moved from Rawalpindi,Punjab,Pakistan to India during Partition of India Er.Ing.Dham graduated with BE degree in Electrical Engineering from Delhi College of Engineering in 1971 at the age of 21. At the age of 25, he left his family in New Delhi to study for MS degree in Physics in the USA,arriving with just $8 in his pocket. He is married to Sadhana and has two sons.He has three brothers and a sister. After completing BE degree in Electrical Engineering in 1971;he joined Delhi-based semiconductor manufacturer Continental Devices, one of India’s only private silicon semiconductor start-ups at the time which collaborated with Teledyne Semiconductor Company, USA.He was a part of the early team that put together facility in Delhi and worked there for four years.It was while he worked at this company that his love for semiconductors bloomed.He found it to be a very exciting field because it applied knowledge he had learned as an Engineer and decided that he needed deeper understanding of the Physics behind the behavior of the semiconductor devices. In 1975, he left this job and went to University of Cincinnati,in Ohio to pursue MS degree in Physics (Solid-State).After getting MS degree in 1977;he joined NCR Corp at Dayton, Ohio,as an Engineer;where he did cutting-edge work in developing advanced non-volatile memories.Joining NCR was not a planned career move though.At the University of Cincinnati when NCR needed help Dham was the student in his class who had worked longest in semi-conductors.His leading edge work on Non Volatile Memories helped NCR get a patent in 1985 on mixed dielectric process and non-volatile memory device. He then joined Intel Co; as an Engineer, where he led the development of the world-famous Pentium Processor. He is called the “Pentium Engineer” for his role in the development of the Pentium Micro-Processor. He is also one of the co-inventors of Intel’s first Flash Memory Technology (ETOX). He rose to the position of Vice-President of Micro-Processor Group at Intel Co.
During a presentation of his work on Non-Volatile Memory for the NCR Microelectronics at an IEEE workshop;he was approached by Intel Co.and joined Intel Co. as Engineer in 1979 where he worked with the Non Volatile Memory team and was one of the co-inventor of Intel’s first flash memory(ETOX).He later moved to the micro-processor division where he honed his skills for leading the Pentium project by working on two earlier generations of micro-processors-Intel’s 386 and 486 in various capacities.In 80s,PCs had become mainstream tools for productivity enhancement at the workplace.By the time he started the Pentium project;large number of established and new players,including AIM consortium(consortium led by Apple,IBM and Motorola) and ACE(Advanced Computing Environment)consortium formed in 1991 and led by Compaq, Microsoft, DEC,and MIPS Technologies,and a consortium by Sun MicroSystems(which comprised Sun,Fujitsu, Philips,Tatung and Amdahl)using superior RISC(Reduced Instructions Based Computing)had all begun aggressively working on their big idea for PC industry and these projects seriously threatened Intel’s dominance in segment.Er.Ing.Dham believes that Intel’s ability to ‘focus and execute’while maintaining full compatibility of application with its previous generation Micro- -Processors was the key reason for it’s success over dozens of these big competitors.His role as a Project Manager of Pentium Chip was acknowledged the world over.From the Intel Inside brand building campaigns to delivering a top notch product,the whole mix worked brilliantly for Intel Co.In a Business Week cover story on Intel’s new processors,Er.Ing.Dham was quoted as General Manager of the 586 processor group(586 was internal name for project until it was named ‘Pentium’ at launch)Pentium was aimed at large computers as well as PC’s,so Intel Engineers had to envision how it would fit in various systems.Design Engineers first visited every major customer and major S/W houses such as Borland,Lotus and Microsoft to ask what those Companies wanted.The result was a list of 147 specific features,many ranked differently from what Intel Co.expected.Doing this at the front end;Er.Ing.Dham said,more than paid for itself by avoiding most revisions in later stages.Er.Ing.Dham was pleased about the mindset change.Pre-586,Intel Engineers got their kicks from intellectual joy of devising elegant efficient solutions to circuit design problems,regardless of their value to customers.Now,said Er.Ing.Dham;Engineers think like customers(Ref:Business India518 June 1995)In 1995;at age of 45,after spending 16 years at Intel Co.and reaching top management of Intel,Er.Ing.Dham had a mid-life crisis and was eager to do something different.He believed;if you live in Silicon Valley and have not experienced life as an Entrepreneur in a world of start-ups;you have missed out on a very exciting learning experience. He left Intel Co.in 1995 and joined a startup NexGen, which was subsequently acquired by AMD. Er.Ing.Dham played an instrumental role in the launch of K6  the “Pentium killer” processor at rival AMD Co.He held the Vice-President position of AMD’s Computation Products Group.He then went on to lead a nascent startup, Silicon Spice in April 1998,which he re-directed to build a VOIP Chip and sold it to Broadcom in 2000.He then launched an incubator NewPath Ventures,where he co-founded companies with an objective of using India’s emerging talent in chip design for R&D. He is currently Managing Director and founder of Indo-US Venture Partners, an early stage India focused fund that he founded after NewPath.Er.Ing.Dham has over the years been a Board member and Tech Advisor to dozens of Private and Public Companies world-over! In February 2015;Er.Ing.Dham announced his return to entrepreneurship as the Co-Founder and CEO of Acadgild;an online educational platform he co-founded with India’s storied entrepreneur duo-Krishnan Ganesh and Meena Ganesh of Tutor Vista fame.Acadgild aims to teach just about anybody, including a Class 10 student;Software Programming that is relevant to today’s rapidly evolving digital world.Unlike many existing online courses that rely on videos;Acadgild provides live mentoring and hands-on engagement for building real applications for its students.It will also include building two applications, thus preparing the students for job ready skills and a more effective way for their perspective employers to evaluate them. When Er.Ing.Dham had joined Intel Co.;it had a mere $1 Million revenue.By the time he left in 1995;Intel’s revenues had soared to $16.2 Billion.Er.Ing.Dham said;he was a keen observer of how Andy Grove built strategy and organisation for Intel’s success in Micro-Processor Business. At Intel Co;Er.Ing.Dham made a decision to work on processors when he decided to leave R&D.By the time he quit Intel;his achievements reached a great prominence.It was also the time when entrepreneurial revolution in Silicon Valley was at its peak.He came across a Company NexGen,a boutique Processor Design Co.that was eight years old,and joined as COO.NexGen was the only Company that was developing Intel compatible Micro-Processors at time.Design Engineering team at NexGen proved itself to be very capable;but the Company did not have a chip that was bus-compatible with the Pentium;an important functionality that was needed to fit in PC industry dominated by Intel.Er.Ing.Dham;with his wide-ranging experience;did changes in NexGen’s strategy knowing that NexGen had to license Intellectual Property(IP)that would piggyback on infrastructure that had already been created by the rest of PC industry and needed access to manufacturing capabilities and advanced technology by partnering with established players for building it’s chips competitively with Intel’s. Er.Ing.Dham, who had made a career out of micro-processors, was no longer interested in just chips,which form the guts and brains of PC.Rather,he was preaching a new mantra:communications processors.”The microprocessor business had become less interesting business to me,” he said. In his opinion, the Internet was the mother of all killer applications,which could utilise most computing power if there were no connectivity bottleneck. Anyone who could help unclog this bottleneck, would hold the key to a multi-billion-dollar bounty.”The PC was designed for computing, and not for communication. The micro-processor has gone beyond its use,” he said.In other words,hardware is far ahead of the current computing requirements” he said.With demand for communications-related chips then growing at 20% per annum;Er.Ing.Dham and Silicon Spice’s three MIT Grad Co-Founders;wanted a piece of the pie.Silicon Spice raised more than $34 Million in VC from top-drawer firms-New Enterprise Associates and Kleiner,Perkins;Caufield&Byers. Er.Ing.Dham also donated to and is involved with TeachAIDS where an interdisciplinary team of researchers from the fields of education, public health, communications and medicine have been working together to develop pedagogically grounded,research-based,rich-media applications to promote HIV/AIDS prevention despite numerous social and cultural barriers.He and his wife Sadhana,who is also on the Board of Advisors,have also been long-time supporters of Home of Hope,a charity with a mission to provide the basic necessities of life to orphans and underprivileged children in India. In 1993;Er.Ing.Dham was named one of the Top 25 Executives in the US Computer Industry.In 1999; he was named one of the top 100 Most Influential Asian Americans of the decade.In 2000,he was appointed to serve on the President’s Advisory Commission on Asian Americans and Pacific Islanders by President Bill Clinton. On 1 January,India’s premier magazine India Today; listed Er.Ing.Dham among the Global Indian Achievers.Er.Ing.Dham said; the survival instinct is the critical factor underlying the success of Indians in Silicon Valley. Er.Ing.Dham was profiled at the Pravasi Bhartiya Diwas in 2007,organised by the Ministry of Overseas Affairs of the government of India;a high recognition for Global Indian Luminaries including Amar Bose, Indra Nooyi, Vinod Khosla, Arun Sarin, Lakshmi Mittal. Er.Ing.Dham was profiled by India Abroad among 50 Most Influential Indian Americans. Scribd profiled Er.Ing.Dham amongst great Indians of this Century and contributing today. Er.Ing.Dham was awarded the NRI Achievement Award at the NRI Global Summit in Oct 2009 by the NRI institute, a New Delhi-based nonprofit.NRI Institute has a nearly 30-year history of recognizing Pravasi(non-resident)such as Sam Pitroda,Chairman of India’s National Knowledge Commission,Lord Swaraj Paul,British Parliamentarian and Founder of Caparo Group,and Baron Karan Bilimoria of Cobra Beer. On 22 April 2011,Er.Ing.Dham was given People Choice Award and Special Jury Award in the category of Science and Technology by Times of India Group’s Light of India Awards; recognizing Indian achievers abroad. On 13 November 2014,Er.Ing.Dham was honored with ‘Lifetime Accomplishments Award’ by VC Taskforce,a Silicon Valley-based organization boasting 6000 members dedicated to promoting innovation through Venture Community. On December 8th;2014,a local Indian Court in Hyderabad;India held Er.Ing.guilty and fined him Rs.20,000/-for not performing the duties as an Independent Director of Satyam Computers-Hyderabad IT Co.
“To stay globally competitive the nation must do better at steering its youth toward engineering careers”. Vinod Dham is among a growing number of technology executives warning that the U.S. faces an Engineer shortage.